Versatile table makes small-space living easy and comfortable. 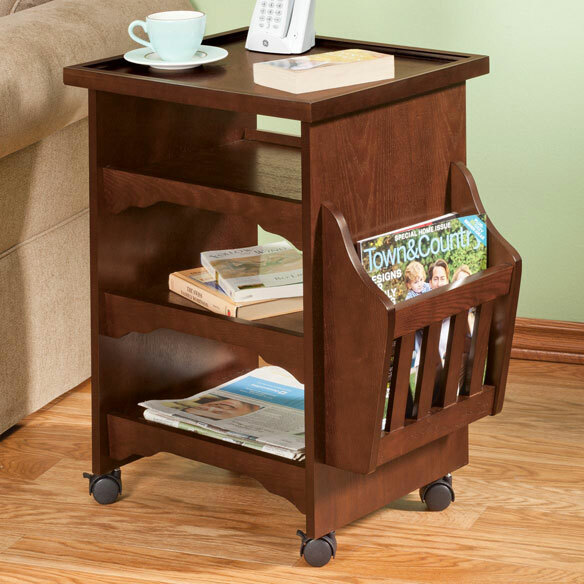 Deluxe rolling multipurpose table exclusively by OakRidge™ Accents features tabletop and 3 shelves with raised edges and side rack for your favorite catalogs and magazines. Casters allow you to move it from room to room then safely lock in place. Rich mahogany or honey finish on this rolling table complements any décor. 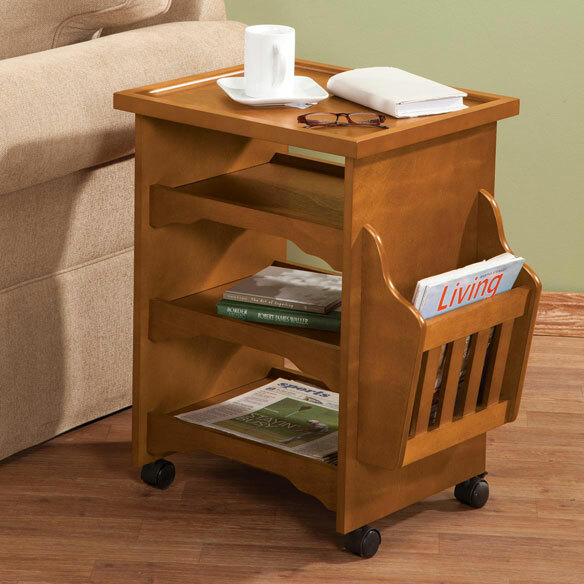 Ideal as a side table, tea cart and more. Some assembly required. 18 1/2" W x 25 3/8" H x 15 7/8" D. Weighs 25 lbs. No express shipping. Love the wheels and the raised edge on the shelves. I use it beside my favorite chair. The 3 shelves are perfect for organizing things I like close at hand. It is sturdy yet can be moved easily. It also stays in one place, does not move with everyday use. its pretty and sturdy, the only part that didn't work for me, and it was my fault, was when I put one caster on, It stripped a piece of wood off it, but I quickly fixed it with some glue. its a great table. Bought for my mother as a gift, and she loves the space that it has. She wants me to get her another one for the side of the bed. In my bedroom I have a recliner to read or watch TV, anyway I needed a table to hold my books magazine, art and crafts, journals, poetry study notebook, maze craze, extreme dot to dots, word find books, markers, glue sticks, just all the stuff I use with my portable desktop on my recliner. This table was perfect plus looks nice, and the magazine holder holds a lot with easy reach. This table sits between our two lounge chairs. Fits perfectly just as I planned. Great height. I will be buying this end table again in the near future! I bought this table for organization. I have room for everything and more. It's beautiful and looks great in my living room. I'm using it as an "end" table by recliner for my devotion books, magazines, etc. Fits our needs like a glove ! I would purchase this product again. I use this table to hold and hold my books, magazines, iPad, phone and papers next to my chair. It's holds all my paper work, reading etc.. And is within reach. Very useful, plenty of shelf space. Very useful. The deluxe shelf unit is attractive and functional. Great product.Works great as a lap top desk. The three shelves allow my husband to store his medications, eye glasses, magazines and other .incidentles. It gives the appearance of a more expensive item. Challenging to put together; if successful, it works! It takes 2 people to assemble this unit not to mention patience! It is between our two chairs and works well. Somewhat hard to put together. Used in living room between two chairs. I have been looking for a table with shelves to keep my knitting and books on by my chair. This was great. The only problem it did not come with assembly instructions. But I have put together enough of this kind of thing I was able to get it together on my own. The rolling cart is next to my recliner in the LR and has various boxes/baskets to hold office supplies; medications; personal files and other miscellaneous items. The magazine rack is very convenient. The mahagony is a very nice color which goes well with my LR tables. The one big negative is that the shelves aren't bigger. Another 1/2 to 1" wider and longer would work out much better. Table is on rollers, 3 shelves give storage space and top for laptop. Instructions to assemble the 20 pieces and 60 connectors were totally inadequate. I had to take it apart and reasemble after I finally figured out how to make the connectors work. Do not tighten the odd looking bolts too tight just to the end of the threads. Assembly method weak, falling parts with movement. Use for frequent needs next to La-Z-Boy but parts dropped immediately with movement. Loaded will not be able to roll on wheels because of poor assembly method. Was really looking forward to getting this table,but was disappointed when my husband,who works construction and reads instructions very well, struggled putting this table together. Odds parts were sent that didn't work well in screwing the shelves together. He used wood glue to hold the table steady. This table was not cheap, but was very cheaply made. Not worth the money and doesn't look as nice as it looked in the catalog. Husband tried putting it together and it was very unstable I would not put anything on it which wasn't a problem because it fell apart before I had the chance. 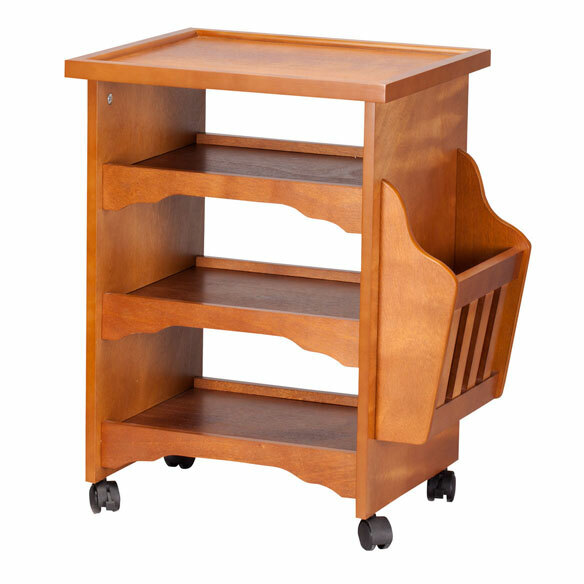 I just bought one and love it because of the lips on the shelves keeping things from rolling off, because of the wheels on it that turn and make it easier to retrieve things from all sides and from the beauty of the wood that matches my other furniture in the room. As a senior this kind of furniture is a godsend. Thank you for offering us these beautiful choices. Chose for its small size, shelving and magazine rack and it will fit in a corner. To hold telephone, tissues, magazines, beverage next to recliner where my mother spends most of her time (on a special care living floor). The style matches her furniture and the wheels make it versatile. We got one of these for my mom and liked it so we are getting one for my dad. It is to used as a substitute for a t.v. table. was the style that I wanted and also the dimensions. This will be helpful to use with our reclining sofa which has a very small space for an end table. I can roll it out of the way after I'm done with it. Needed smaller size table for my computer area. Easy assembly. Table looks great. I need a place for my printer and papers. More importantly this unit is on wheels so it can be moved easily. Fits needs for versatile end table. Need something next to chair to hold books, papers, etc. It looks like it is just what I need. I like the ledge around the shelves, so magazines won't slide off. The rollers will make it easy to move around to clean under. until I can read the. Goes beside my chair. I chose this item because of its size and the fact that it will meet my needs. I needed something that would sit next to my recliner, that I could have easy access to spread my work out. Size and color fit with the area I will be useing it. I needed sturdy movable side table. It’s just what I need for the clutter now on the floor beside my recliner. I like the looks of it and have the perfect spot for it. Seen in catalog, something I needed to find. Have been searching for a table like this for quite a while. A lot to choose from but not what we wanted This one meets our needs. The item seems to be uniquely suited for my needs. Need a reasonable price side table for my chair. I HAVE IT SITTING NEXT TO MY RECLINER IN MY TV/COMPUTER ROOM. LOVE IT. What is the weight of this table? BEST ANSWER: Thank you for your question. This item weighs 25.75 pounds. We hope this information will be of help to you. what kind of material is this table made from? BEST ANSWER: very nice hardwoods. Since this was for my elderly mother, we put a good waterproof coating on the top of table because she always put her water cups there. Thank you for your question. 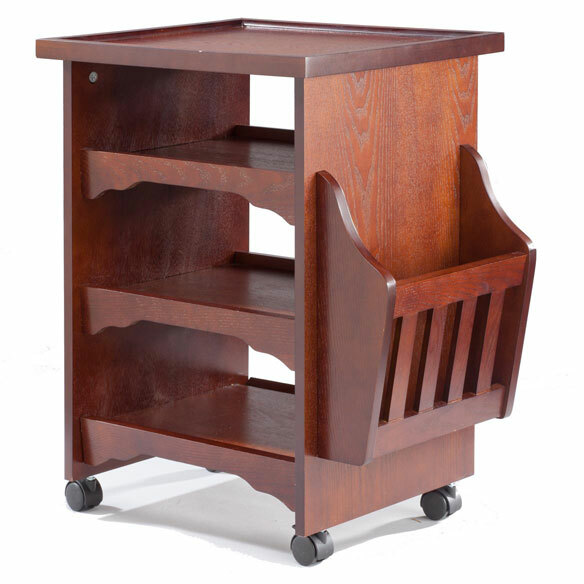 It is made of sturdy fiberboard with mahogany finish. We hope this information will be of help to you. Does the top of the table have a glossy finish which prevents drops of water either hot or cold from penetrating and damaging the fiberboard finish ? BEST ANSWER: No, it is a regular wood finish. How wide is each shelf? BEST ANSWER: Each shelf is 12.5 inches wide and 15.5 inches long. The width measurement includes a quarter inch raised lip on each side which prevents items from sliding off when the table is moved. This is a feature we greatly appreciate. 12 inches, it is a very nice, quality product for the price.